Land defenders block transport trucks, July 31, 2015. Photo: Maui Now. Maui police identified the 20 individuals arrested and charged for blocking a convoy of heavy equipment and telescope parts from being delivered to Haleakala for the ongoing construction of the Daniel K Inouye Solar Telescope. On Thursday, July 30, 2015 at around 10 p.m., officers with the Maui Police Department were summoned to Central Maui Baseyard to assist with crowd control and public safety issues involving the Daniel K. Inouye Solar Telescope transport project. A representative of the Association of Universities for Research in Astronomy initiated a complaint that numerous individuals were blocking the exit, according to Maui police. 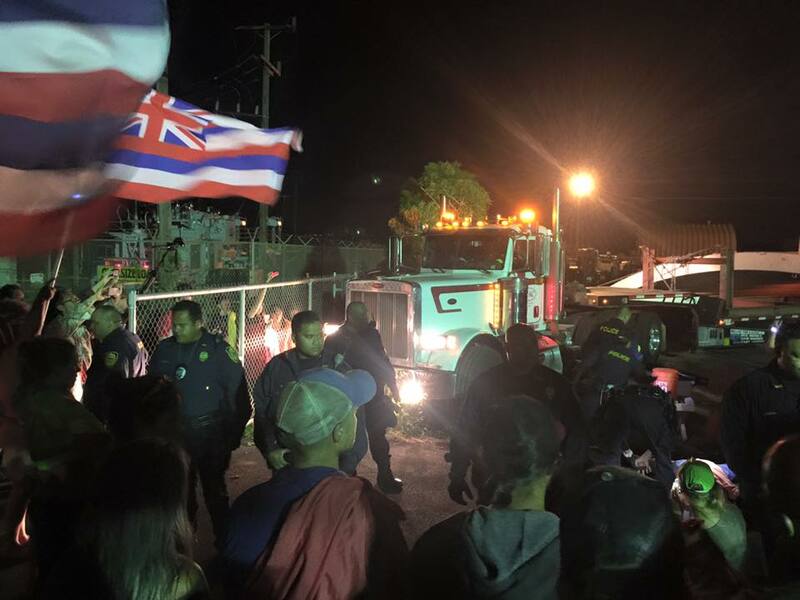 A crowd of demonstrators gathered in front of the Central Maui Baseyard access road and blocked the tractor trailers from entering onto Mokulele Highway. The tractor trailers were transporting equipment for the Daniel K. Inouye Solar Telescope which is currently under construction on the summit of Haleakalā. After extracting individuals, a total of 13 males and seven women were arrested. Cameron Ahia, 43, from Waihee was charged with refusing right of way, resisting arrest, failure to disperse, and disorderly conduct. Bail was set at $600. Hiilei Aiwohi-Kolt 19 from Wailuku, was charged with: Refuse Right Of Way, Resisting Arrest, Failure to Disperse, Disorderly Conduct. Total bail set at $600. Kaena Elaban, 27, from Pukalani was charged with: Refuse Right Of Way, Resisting Arrest, Failure To Disperse, Disorderly Conduct. Total bail set at $600. Kristen Enriquez, 26, from Kīhei was charged with: Refuse Right Of Way, Resisting Arrest, Failure To Disperse, Disorderly Conduct. Total bail set at $600. Wade Homes, 40, from Kīhei was charged with: Refuse Right Of Way, Resisting Arrest, Failure To Disperse, Disorderly Conduct. Total bail set at $600. Jonathan Irvine, 31, from Waiehu was charged with: Refuse Right Of Way, Resisting Arrest, Failure To Disperse, Disorderly Conduct. Total bail set at $600. Kahala Johnson, 29, from Waiehu was charged with: Refuse Right Of Way, Resisting Arrest, Failure To Disperse, Disorderly Conduct. Total bail set at $600. Sean George, 27, from Honolulu was charged with: Refuse Right Of Way, Resisting Arrest, Failure To Disperse, Disorderly Conduct, Contempt of Court. Total bail set at $800. Pohai Kaikala, 20, from Pukalani, was charged with: Refuse Right Of Way, Resisting Arrest, Failure To Disperse, Disorderly Conduct. Total bail set at $600. Dustin Kaleiopu, 18, from Lahaina, was charged with: Refuse Right Of Way, Resisting Arrest, Failure To Disperse, Disorderly Conduct. Total bail set at $600. Christopher Kasak, 37, of Makawao was charged with: Refuse Right Of Way, Resisting Arrest, Failure To Disperse, Disorderly Conduct. Total bail set at $600. Christopher Nakahashi, 31, from Haʻikū was charged with: Refuse Right Of Way, Resisting Arrest, Failure To Disperse, Disorderly Conduct. Total bail set at $600. David Praise, 37, from Wailuku was charged with: Refuse Right Of Way, Resisting Arrest, Failure To Disperse, Disorderly Conduct. Total bail set at $600. Alexander Quintana, 25, from Wailuku was charged with: Refuse Right Of Way, Resisting Arrest, Failure To Disperse, Disorderly Conduct. Total bail set at $600. Stanley Raymond, 60, from Kula was charged with: Refuse Right Of Way, Resisting Arrest, Failure To Disperse, Disorderly Conduct. Total bail set at $600. Sunny Savage-Luskin, 38, from Haʻikū was charged with: Refuse Right Of Way, Resisting Arrest, Failure To Disperse, Disorderly Conduct. Total bail set at $600. Lisa Schattenburg-Raymond, 56, from Kula was charged with: Refuse Right Of Way, Resisting Arrest, Failure To Disperse, Disorderly Conduct. Total bail set at $600. Jordan Takakura-Puha, 24, from Pāʻia was charged with: Refuse Right Of Way, Resisting Arrest, Failure To Disperse, Disorderly Conduct. Total bail set at $600. Tiare Lawrence, 33, from Pukalani was charged with: Refuse Right Of Way, Resisting Arrest, Failure To Disperse, Disorderly Conduct. Total bail set at $600. Samuel Kaeo, 49, from Kula was charged with: Refuse Right Of Way, Resisting Arrest, Failure To Disperse, Disorderly Conduct. Total bail set at $600. Posted on August 2, 2015, in Uncategorized and tagged Daniel K. Inouye Solar Telescope, Haleakalā, Hawaii, Hawaii Indigenous, native blockades, native protests. Bookmark the permalink. Leave a comment.